March Mommy & Me - Wed., Mar. 7 - Incredible Pizza Company - Enjoy our huge all-you-can-eat buffet, indoor Go-Kart Races, Bumper Cars, Route 66 Mini Golf, a huge video game arcade with prizes, Bowling, and more! Nothing beats spending some fun, one-on-one time with your preschooler! They have so much energy and are almost always very entertaining. But, sometimes a mama brain just cannot think of one more creative thing to do, and you could use some help! Or, you just want to get out of the house and try something different! Wouldn’t it be fun to go somewhere and enjoy the company of other moms and preschoolers, and let someone else help with the entertaining? At Conroe’s Incredible Pizza Company, we may have just the thing for you! Coming up, Wed., Mar. 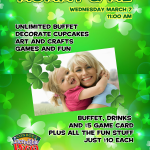 7, is our March Mommy & Me event, from 11 a.m. – 1 p.m. We’ll have cupcakes for decorating, art & crafts, games and fun! And, since it is St. Patrick’s month, our theme will certainly involve the color green and St. Patrick’s Day. Admission is just $10 per person and includes the planned activities; unlimited buffet and drink; and $5 game card. Kids ages 0-3 years are free. Can you think of some of your mom friends that might like to join you? Invite them to come along! After the event is complete, be sure to stay and play in the Fairgrounds or in Playland. Our preschool guests love climbing on the molded vehicles; riding the choo choo train, driving the interactive boat and playing on the playground. If you plan on attending, please RSVP by placing your name and the number of children you’ll be bringing, in the comments of our Facebook event page. 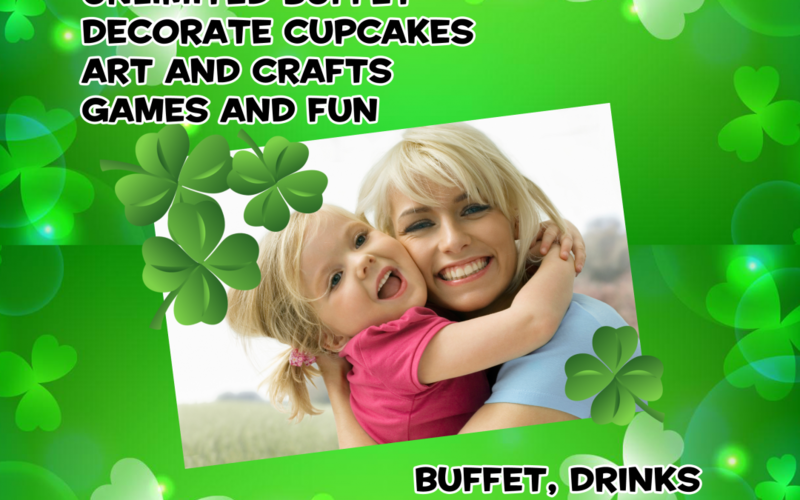 We can’t wait to see you and your wee ones for our St. Patrick’s March Mommy & Me event!